Purchased for almost US$1 million on LedgerX’s trading platform just days after Bitcoin peaked a year ago, the call options have a strike price of $50,000 and an expiry date of Dec. 28, 2018. For the contracts to retain any value at expiry, Bitcoin would need to rally more than 1,200 per cent. When the options were purchased, causing a stir in crypto circles, Bitcoin was trading at about US$16,200. The virtual currency has since tumbled to US$3,800, mired in one of the worst bear markets since its inception a decade ago. “These calls let me capture upside while reducing my downside risk,” Paul told CNBC. He later tweeted that the trade -- selling some of his Bitcoin holdings while buying the call options -- was profitable. 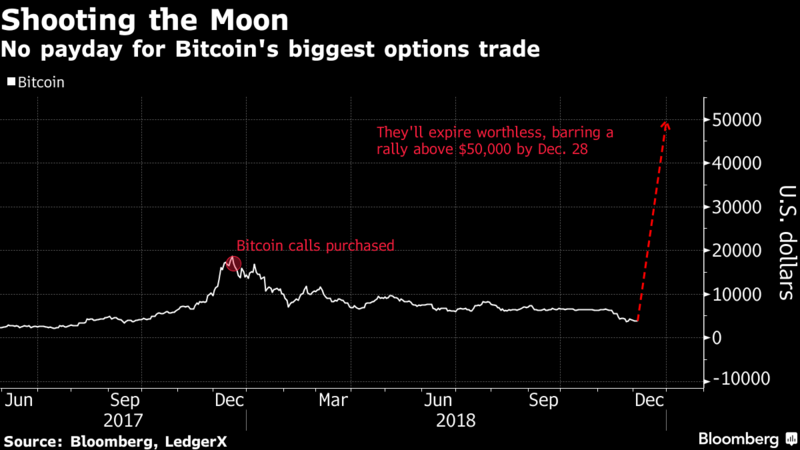 LedgerX, the first U.S.-regulated Bitcoin options exchange, declined to identify the buyer or seller of the calls but confirmed that the position, which has a notional value of US$13.75 million, remains the biggest Bitcoin options trade to cross its platform.